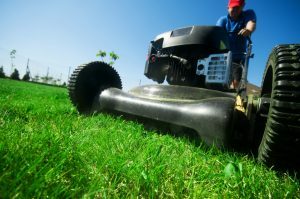 Cutting your lawn too short- We all love to have a beautifully manicured lawn, but cutting your grass too short, also referred to as scalping, won’t leave enough healthy tissue in your grass to heal properly. It also makes it easier for the sun to dry up the soil. Getting rid of grass clippings- No one loves the look of grass clippings in their lawn, but it contains a great deal of vital nutrients that can help to keep your lawn healthy. Grass clippings can also hold more moisture in your soil, which will allow you to water less often. Neglecting to sharpen the blades in your lawn mower- Dull lawn mower blades will rip or tear the grass you are cutting, while a sharp blade will cleanly cut it. The tips of ripped or torn grass can easily become bleached out by the sun, and they will eventually turn brown. Keep your blade in great shape by resharpening and balancing it a few times a year.